Empower Media She is not only Canada’s first and only female Top Fuel pilot, Kelly is on a mission to become the Fastest Woman in Canada! 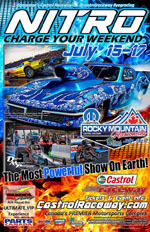 Online Article - Drag Race Canada.com by Bruce Biegler " Mopar Rocky Mountain Nationals Edmonton Event (Photo) Extra!" Online Article - Bang Shift.com by Darr Hawthorne "IHRA Mopar Rocky Mountain Nationals – Wild Photo Sequence Inside"
Online Article - Drag Race Canada.com by Bruce Biegler "IHRA Mopar Rocky Mountain Nationals – Edmonton Essentials!" 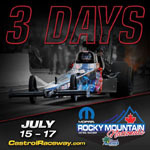 "The event will also feature a bonus Canada versus USA Top Fuel match racing featuring Indiana’s Bruce Litton versus Calgary’s David Fedorowich. Fedorowich currently races Western Canada’s only Top Fueler – the Dark Side Racing dragster – a community focused and family owned machine operated by David, Kelly and Nikolas Fedorowich. Win a Trip to the Strip this season with Blackjacks Roadhouse and Dark Side Racing! Dark Side Racing will be distributing entry forms at all of our events, all season long. Online Article - Drag Race Canada.com by Bruce Biegler "A Different Stomp for Stamp! Record setting CFL running back Jon Cornish got a recent unique Top Fuel car experience…. Fast forward to the 36:20 minute mark to hear Sport Talk's Jock Wilson and Mark Stephen comment on the warm up. We light it up on Nitro at the 40:00 minute mark - Jock and Mark struggle to hear themselves over the roar of the engine! Interview with CJ92 Gerry Forbes. 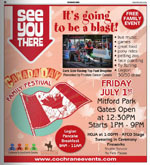 Interview with Global Edmonton's John Sexsmith. 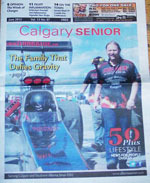 Online Article - Drag Race Canada.com by Bruce Biegler "Rocky Mountain Ramp Up"
Online Article - DragRaceCanada.com by Bruce Biegler "Top Fuel Fix Coming to Canada"
Online Article - DragRaceCanada.com by BJ White "Top Fuel–Cause & Effect "
Thunder in the Valley -- Drayton Valley, AB "Program"
Online article -- Drag Race Canada.com By Bruce Biegler "Hot August Night has Darkside"
Online article -- Calgary Herald -- Driving.ca By Greg Williams "It's All About Hot-Rod Power with Dark Side"
Calgary Herald Article -- Driving.ca By Greg Williams "It's All About Hot-Rod Power with Dark Side"
Online article -- Drag Race Canada.com By Bruce Biegler "Coverage for the upcoming Prostaid Calgary Do It For Dad Father's Day Walk/Run "
Online article -- Driving.ca By Greg Williams "PCCN Calgary's Fast Approaching Fun in the 50's Car Show "
"Creating of the Lake Bonavista Show`n Shine" on SHAW TV Calgary Channel 10 Dark Side Racing was featured prominently in Al's epic production.